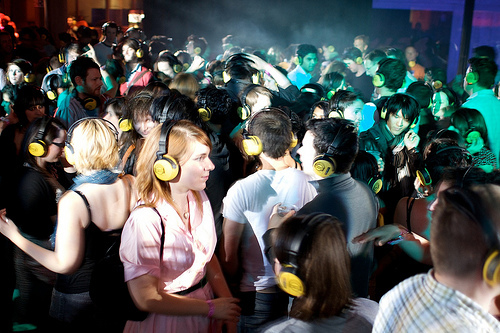 Silent Discos seem like a convenient solution to common problems such as noise limiters and live music licensing. However, there are things you need to know and consider before throwing one of these unusual and oh-so-21st century parties that could save you time, money, and a serious lecture from venue owners and their neighbours. It’s not as silent as you think. Yes, the music can only be heard through headphones, and no, there aren’t enormous speakers blaring out heavy, wall-shaking basslines. Nevertheless, there will be people, there will be alcohol, and there will be smokers, and while the music may not be heard, these other components of the event will inevitably create a certain amount of kafuffle. Consider the smoking area at the venue very carefully. How close is it to neighbour’s properties? Is there somewhere more secluded, soundproofed yet still open-air that would be more suitable as a makeshift ashtray zone? How many people should be allowed out at a time? It’s even worth hiring an extra member of door staff to play the specific role of ‘Husher’ – simply ensuring that people keep their voices down at all times while in complaint-risky places. 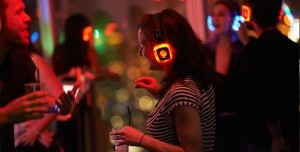 One of the luxuries of a silent disco is that once you’re at the bar, you can simply remove your headphones, and have the wonderful (and rare) experience of being able to order drinks in your normal speaking voice – but if a headphone-less crowd gathers and embarks on vivacious conversation, you’ll soon find the noise levels creeping up. It’s just a question of encouraging them to return to their previous position on the quiet but lively dance floor, by using a few gentle ‘this tune is good’ and ‘the break is about to drop’ comments. Don’t be afraid to reinforce the idea of quiet. 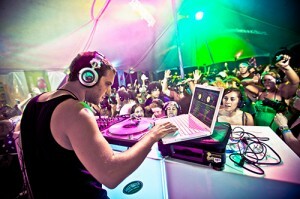 You’d think that hiring a DJ without loud speakers or mixing monitors would be cheaper, but unfortunately, it isn’t. While the vast majority of DJs work from CD decks (or those horrible pre-mixed MP3 sets, which is just blatant cheating and a total scam), you must make sure that their equipment is compatible with the headphones you’ve hired from a Silent Disco company. This entirely depends on the gear involved, and it’s best to put your DJ and your hired company in touch with each other so they can discuss whether their gear can be attuned. 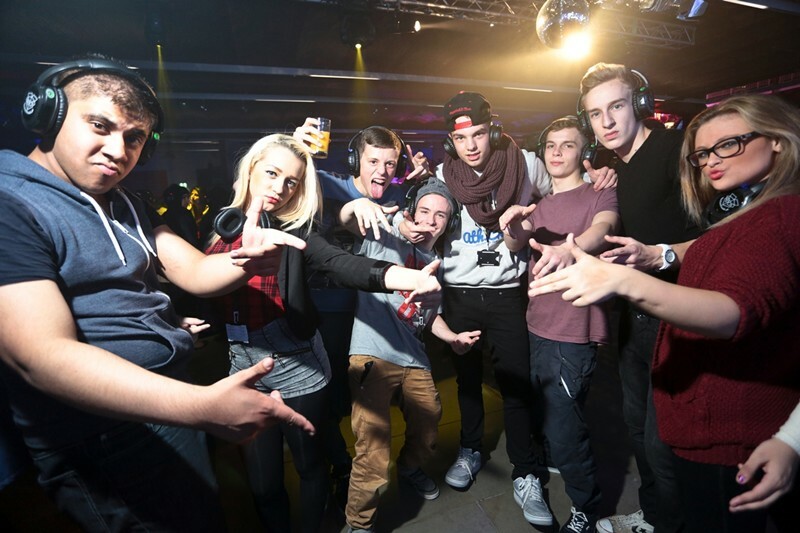 This is an important issue that is often overlooked – many people have assumed that a wireless connection is a wireless connection, and it’s as simple as that – but actually, there’s a lot more to it and good sound quality is only guaranteed when these details have been ironed out, and these people have had a nasty surprise on the night of their event when confronted with crackles, cut-out’s and malfunctions within the connection between sound system and headphones. This is particularly important for open-air events where a larger range/reach is required. 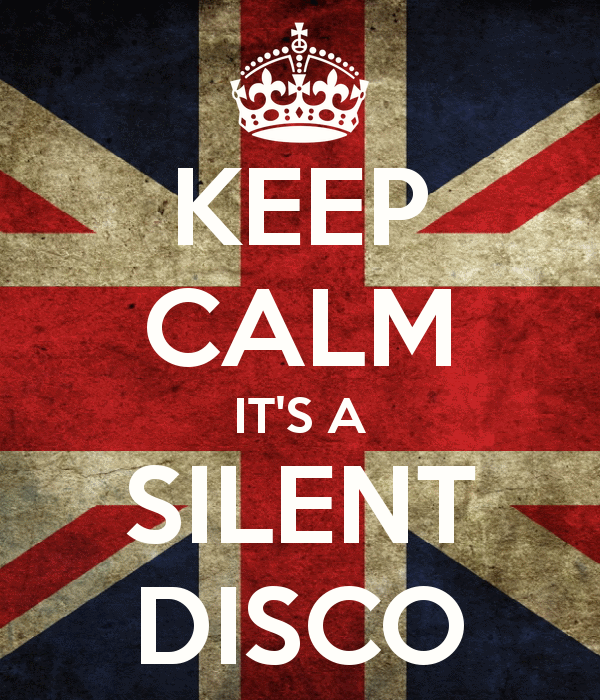 This may seem like a slightly bizarre suggestion, but having quiet background music playing in the venue while the silent disco is going on is a must. When headphones are taken off, the silence can be really quite strange, and the party atmosphere disappears almost instantly…no matter how funny it is watching your friends dance around like crazy people to a seemingly non-existent soundtrack. 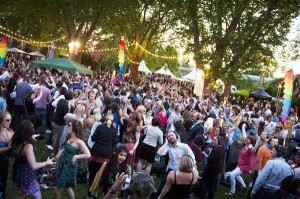 Having sounds on in the background keeps people in the party spirit, but can also be used to calm them down – and if they did want to sit and chat quietly for a while, a more relaxed and easy-going ambience will be achieved with no awkward silences or the unavoidable overhearing of unintentional grunting, exhaling and foot shuffling going on in the crowd. Make sure you get back exactly what you gave out. You may be surprised at how inexpensive it is to hire the headphones and equipment for a silent disco. Be warned, though, that one of the ways these companies make most of their money is by charging seriously hefty prices for lost, stolen or damaged goods. When the crowd leave the venue, you must make sure that you retrieve every single pair of headphones. People often assume that they’ll work with a wireless TV or MP3 player, and so many of these gadgets could be placed in handbags and under shirts, that you suddenly find yourself with half the amount you originally had. The solution is simple but slightly daunting – a single file exit from the venue with a strict ‘give them back’ policy is really the only way to tackle this problem. Experienced and professional door staff are the real solution, and they must be under strict instruction that nobody is to leave without returning their headphones. It will save you a fortune, particularly if you’ve opted for a luxury line of products that have attractive design features. For advice on venues that can accommodate silent discos, you can use our free service by filling out our online enquiry form, and we’ll source you a reliable and accommodating venue that can meet your requirements. Or, you can phone us here!